Claire Redfield is a character in the Resident Evil horror video game series. I was commissioned to make Claire Redfield’s knife from the video game Resident Evil: The Darkside Chronicles. The final knife will be shipped to my friend Fevereon in Atlanta so she can make a sheath and shoulder holster for it. Because of the engraved logo on the blade, I decided to have the parts laser cut out of a compressed wood (very much like MDF) by friends at Scorpion Ridge Engraving. 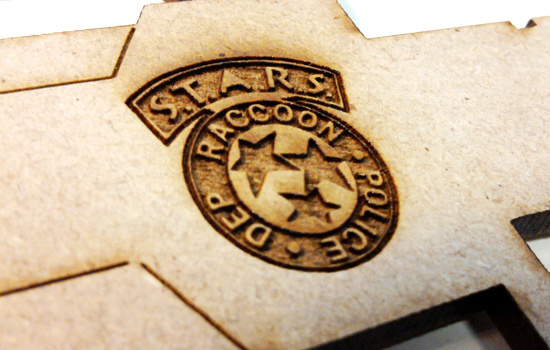 Here is a detail of the laser engraved logo. There’s just no way I could’ve done this by hand! Plus it’s identical on both sides of the blade. The guard was also laser cut as a separate element. It fits perfectly. The final component is the grip texture. I had the checkered pattern laser cut deeply out of the surface. 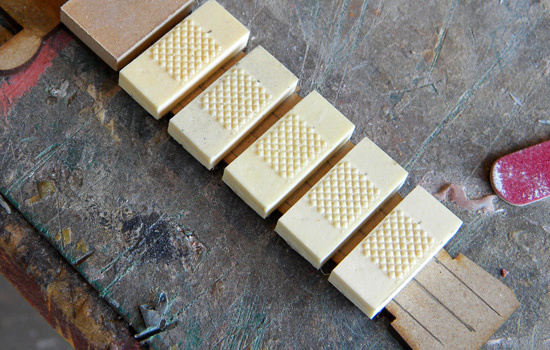 I then used fine files to bevel each edge of the little squares so I wound up with a texture of fine, raised diamonds. I then made a silicone mold of the grip segment so it could be duplicated in resin. Here are all the pieces for one half of the grip. For the insets between grip panels, I glued on 1/8” balsa strips. I also used the balsa to frame out the pommel. 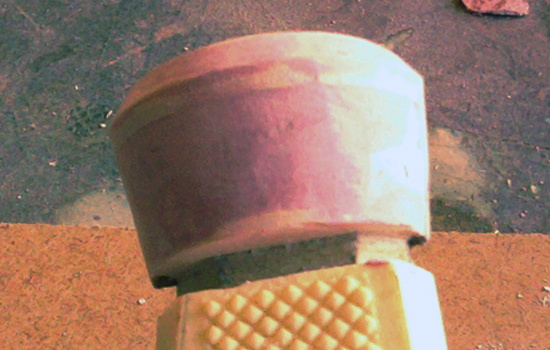 I shaped the insets before I added the grip panels….much easier that way. The panels are a bit wide so I had to trim off a sliver on each side. A quick test fit…everything works so far! I beveled the back side of the grip, glued them in place and then shaped the curved bevel of the other side. I glopped Bondo into the pommel until it filled the framed area. The smooth sanded pommel half. I used the laser-scribed line as a guide to carve an edge on the blades. A test fit of two blade halves together. A coat of primer to clean up any small defects. I thinned a coat of Smooth-On Stroke to capture the fine detail. A thick coat of Stroke to build the mold walls. After I made a support mold with Plasti-Paste, I pulled my masters out. The mold turned out super clean! I poured a small amount of resin into the mold and then added a thin steel rod for additional support. The guard also got a small steel bar. The two halves glued together! I filled the seam and gave it a coat of primer. It’s a very comfortable knife to hold. Time to find a zombie to stab!